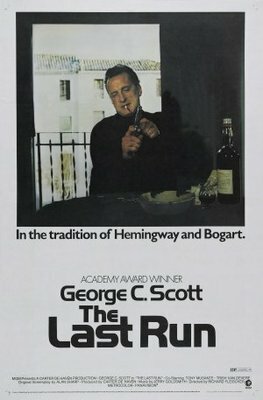 Harry Garmes (George C. Scott) is a long-retired professional criminal, living in hiding on the Portuguese coast. Harry unexpectedly receives a job offer: to drive an escaped convict from Spain across the border into France. Desperate to recapture the thrill of his past life one more time, Harry runs into unwanted complications - including the convict's girlfriend and a sudden double-cross that puts his own life at risk. The Last Run was not a success back in 1971. For one thing it was a deeply troubled production, with an ascendant George C. Scott using the success of his critically acclaimed performance in Patton to leverage a lot more control over the production that he'd previously enjoyed. He fought so vigorously with director John Huston that Huston walked, with Richard Fleischer (20,000 Leagues Under the Sea) taking over after the shoot had commenced. Scott fought for his wife to be cast in a key role, and by the end of the shoot had left her for his other female co-star. Once released in cinemas the critical response was muted and the cinema-going public essentially ignored it. The film is now available via the Warner Archive range of print-on-demand DVDs, and it turns out to be something of a hidden gem. There is an element of 'they don't make 'em like they used to' about The Last Run. The film boasts a stripped-back, lean narrative that does not waste its time on subplots and does not hang around with unnecessary character work. It gets in, sets off and rockets from opening to climax as fast as Harry's own beloved sports car. Scott makes for a striking and charismatic lead. Harry is ageing fast, but he remains a sharp and smart professional driver. We first encounter him doing maintenance work on his car. Throughout the film we see him playing things with a cool head and a minimum of fuss. It is almost entirely Scott's film, and there is barely a scene in it that does not feature him at the centre. His character contrasts nicely with Tony Musante as Paul Rickard, the hot-headed and egotistical criminal that he rescues from a prison transport. Where Harry is silent, Paul is noisy. Where Harry is reserved, Paul is boastful. One is careful to raise attention, and the other is all too quick to reach for his gun. It leads to a wonderful amount of tension, since the viewer is stuck waiting to see if Harry and Paul can last in the same car before one of them makes an enemy of the other. Complicating matters is Claudie (Trish Van Deere), Paul's girlfriend who begins to give a lot of time and attention to Harry - but for what purpose? With all three in the one car, the film soon turns into a criminal road trip, throwing up an episodic series of challenges as they make their way towards and ultimately across the border. The car chases, of which there are several, are fast-paced but strikingly realistic. In an age where a franchise like Fast & Furious tops the box office, filled with all manner of digitally-enhanced and sometimes flat-out digital car stunts, it is refreshing to see a film where cars do what cars actually can do, and drive at speeds that are dangerous but - for once - believable. Richard Fleischer's direction is fairly by-the-numbers, as might be expected from his last minute appointment, but Jerry Goldsmith's harpsichord-heavy musical score is effective and very nicely of its time. I suspect nostalgia makes this movie are more enjoyable experience now than it would have been back in 1971. It exudes a sort of stripped-down retro-cool. Scott is a magnetic lead, and Van Deere and Musante provide excellent support. It doesn't waste time, and like a well-built racing car it doesn't have a single redundant element. It is an excellent crime film from start to finish.